Robert Houghton married Esther Leppingwell in 1682 at Woburn/Lancaster, MA, USA, Burr & Gage: "He married Esther ---... She was probably Esther Lippenwell..."; Torrey, b. 1682, Woburn/Lancaster; Houghton: 1680; not in Lancaster VR. Beatrix Houghton+ b. 3 Sep 1685, d. a 12 Jan 1725? Aged 60 Years & 5 Mo. 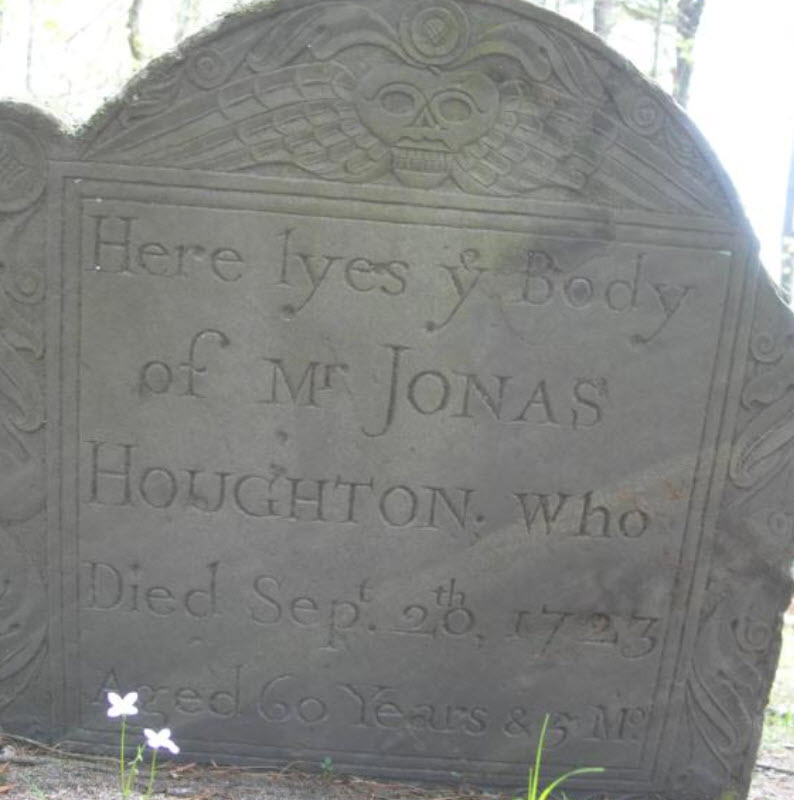 Jonas Houghton married Mary Burbeen in Feb 15, 1680/81 at Lancaster, Worcester Co., MA, USA, Torrey: 16 Feb 1681, 1680/1; Woburn, Lancaster; Clemens: Woburn, MA. Jonas Houghton married Sarah (?) 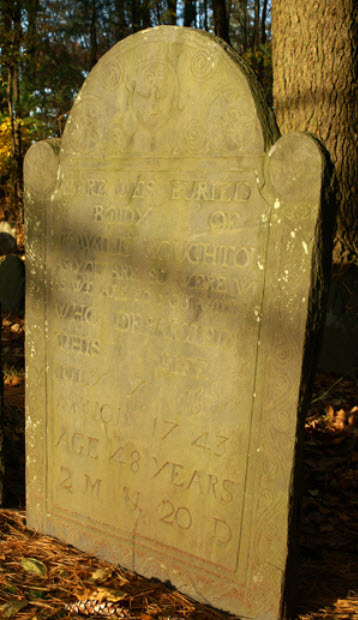 at Middlesex Co., MA, USA, Middlesex Probate; widow at his death; MLM: ca. 1720. Marriage Lancaster, Worcester Co., MA, USA, 23 June 1698: JWH date for John Harris and Sarah Houghton; 1/wf; Torrey gives a Mary Houghton as wife of John Harris, but J.W. Houghton gives John Harris as husband of John Houghton the Immigrant's daughter Sarah (with 1698 date), and Mary as wife of Thomas Wilder; Torrey gives 1/wf Mary Houghton (1666-); while this is a different bd than John Houghton the Immigrant's daughter Mary, John Houghton's will of 1684 clearly gives his daughter as Mary Harris (see Burr & Gage, p. 383). Mary Houghton married John Harris Jr. at Lancaster, Worcester Co., MA, USA, 23 June 1698: JWH date for John Harris and Sarah Houghton; 1/wf; Torrey gives a Mary Houghton as wife of John Harris, but J.W. Houghton gives John Harris as husband of John Houghton the Immigrant's daughter Sarah (with 1698 date), and Mary as wife of Thomas Wilder; Torrey gives 1/wf Mary Houghton (1666-); while this is a different bd than John Houghton the Immigrant's daughter Mary, John Houghton's will of 1684 clearly gives his daughter as Mary Harris (see Burr & Gage, p. 383). NEHGR, 152: after 1684, prob. Lancaster. Boykiw: cites a deed executed on 20 Sept 1734, where the Goble children inherited Lancaster land from their mother, Sarah Goble, wife of Daniel Goble (Worcester District Deeds, Book 7, p. 259). Burial Old Common Burying Ground Cemetery, Lancaster, Worcester Co., MA, USA, "Here lies/buried ye body/of Mrs. Mary/Houghton ye/wife of John/Houghton Esquir/who died April/ye 7 th Ano Dm 1724/and in ye 76th year/of her age"
Mary Farrar married Justice John Houghton Jr & Sr, son of John Houghton and Beatrix (? ), in Jan 22, 1671/72 at Lancaster, Worcester Co., MA, USA, Torrey: 22 Jan 1671/72; Lancaster VRs: 22 11m 1671; JWH: 1,22,1671; Clemens: 10 May 1676; NEGHR: 11/22/1671; MLM: Nov. 22, 1671/2; Nourse, Early Rec. : 11.22.1671. 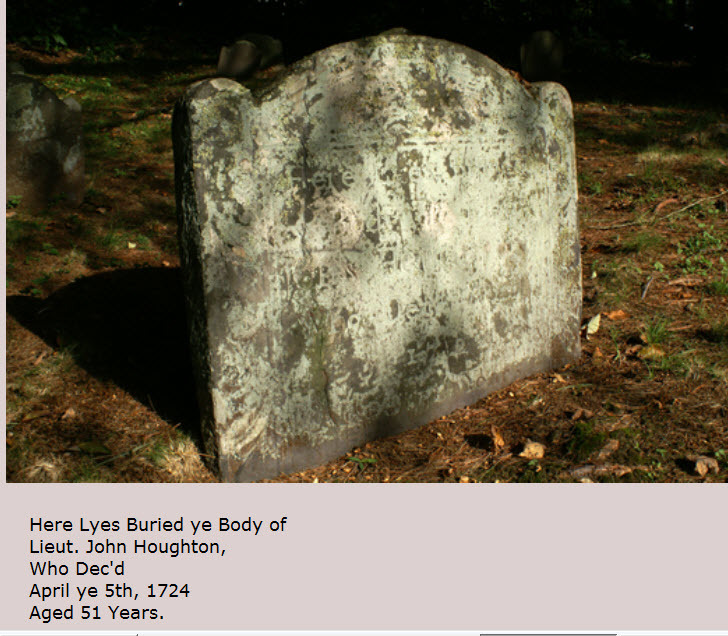 Burial Old Common Burying Ground Cemetery, Lancaster, Worcester Co., MA, USA, "Here Lyes Buried | ye Body of Lieut. | John Houghton | who decd April | ye 5th 1724. | Aged 51Years." John Houghton Jr. married Mary Prescott, daughter of John Prescott Jr. and Sarah Hayward, in Nov 20, 1698 at Concord, Middlesex Co., MA, USA, h/2; Mrs. Mary Goss, by Justice Minott; Torrey: Concord/Lancaster. John Houghton Jr. married Sarah Gulliver in Jan 7, 1719/20 at Lancaster, Worcester Co., MA, USA, by Justice John Houghton. 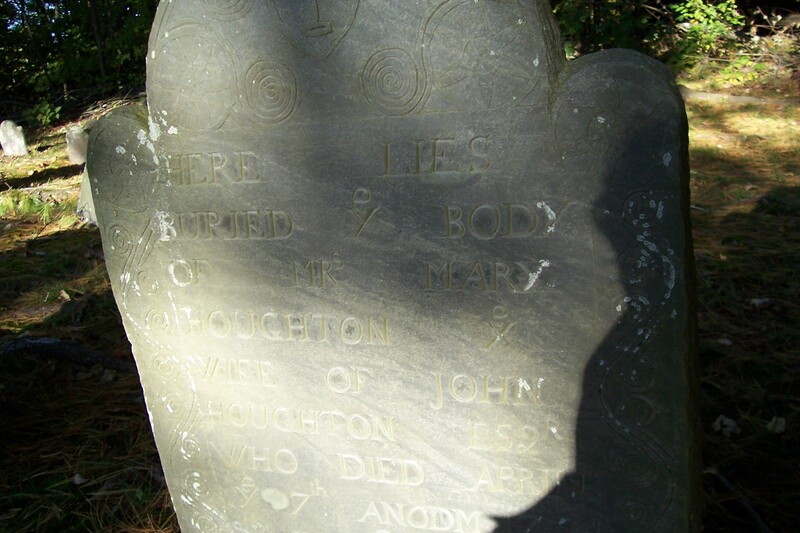 Jacob Houghton married Rebecca Whitcomb in Feb 16, 1694 at Lancaster, Worcester Co., MA, USA, No source appears to give correct md; internet date used. Henry Houghton married Abigail Barron, daughter of Ellis Barron Jr and Lydia Prescott, in Jan 2, 1699/0 at Watertown, Middlesex Co., MA, USA, Torrey, 1st wife; Bond: June 2, 1699-10 [sic]. Henry Houghton married Hannah West in Apr 23, 1712 at Boston, Suffolk Co., MA, USA, BT, 6/27: married by Dr. Cotton Mather. Joseph Houghton married Isabella Houghton, daughter of Robert Houghton and Esther Leppingwell, 1st cousins. Death between Mar, 1746 and Nov, 1746 Burr & Gage: "In the division of the estate of his brother, William (3) Houghton, in 1746, no mention was made of Benjamin, although every other brother and sister and the heirs of deceased brothers and sisters were included in the distribution. No conveyance by Benjamin of his share is recorded, and the division was in equal. It is therefore fairly certain that Benjamin had died s.p. before 1746. "; CJV: Probate of William dated Nov. 1746. But he is mentioned in Mar 1746 of his father John. Mary Houghton married William Sawyer Sr., son of Capt. Thomas Sawyer Jr and Hannah Lewis, in circa 1702 at Lancaster, Worcester Co., MA, USA, Burr & Gage: (Worchester Deeds, lib. 3, p.126);Lancaster VR, 1890: Marriage, about 1702; was 1700 per Cutter; married before 1711 when they joined the church; Sawyer: c 1700. Mercy Houghton married Ebenezer Wilder, son of John Wilder and Hannah Atherton. Anna Houghton married John Priest Burr & Gage: Worcester Deeds, lib. 4, p. 467; MLM: c. 1706. Lieut. Jonathan Houghton married Thankful White in Nov 6, 1712 at Lancaster, Worcester Co., MA, USA. Lieut. Jonathan Houghton+ b. 28 Mar 1719, d. 1808? Hepsibeth Houghton married Joseph Brabrook in 1715 at MA, USA, Worcester Deeds, lib. 9, p. 167. Rebekah Houghton married Deacon Joseph Moore in Nov 17, 1726 at Lancaster, Worcester Co., MA, USA, by John Houghton. William Houghton married Experience Houghton, daughter of James Houghton Sr. and Mary (? ), in Jun 4, 1724 at Lancaster, Worcester Co., MA, USA, by J. Prentice. Esther Leppingwell married Robert Houghton, son of John Houghton and Beatrix (? ), in 1682 at Woburn/Lancaster, MA, USA, Burr & Gage: "He married Esther ---... She was probably Esther Lippenwell..."; Torrey, b. 1682, Woburn/Lancaster; Houghton: 1680; not in Lancaster VR. F, #1462, b. 3 September 1685, d. after 12 January 1725? Marriage Aug 31, 1711 Boxford, Essex Co., MA, USA, Boxford MA Vrs: HOLTON, Beatrix, and Joseph White, Aug. 31, 1711. 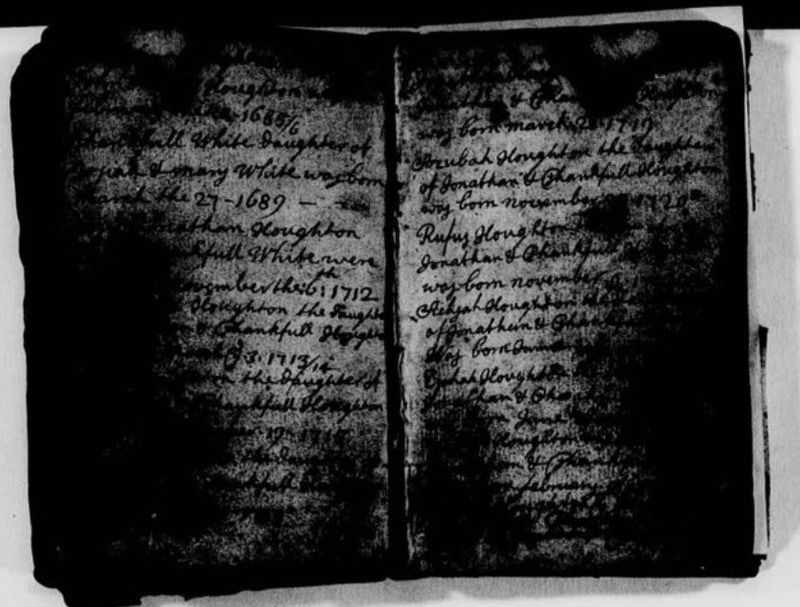 Apr 1728 Probate of father Robert Houghton, "Beatrix, wife of Joseph White"
Death after Jan 12, 1725? 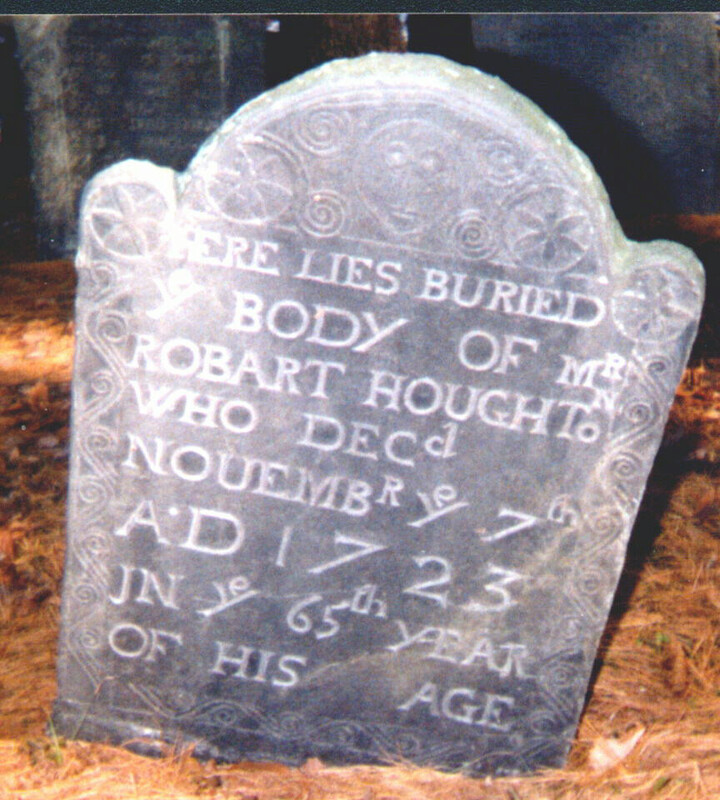 Sutton, MA, USA, She is last known living when on 12 January 1725/6 Joseph White, and wife Beatrix, of Hutchinson's farm. near Sutton, sold land in Hutchinson's farm. Beatrix Houghton married Joseph White in Aug 31, 1711 at Boxford, Essex Co., MA, USA, Boxford MA Vrs: HOLTON, Beatrix, and Joseph White, Aug. 31, 1711. JWH: Beatrix Houghton and Joseph White. Abigail Houghton married Amos Sawyer, son of Nathaniel Sawyer and Mary Houghton?, in May 14, 1719 at Lancaster, Worcester Co., MA, USA, by John Houghton. Eleazer Houghton married Elisabeth Divoll in Mar 11, 1718/19 at Lancaster, Worcester Co., MA, USA, by Justice John Houghton; Burr & Gage: Worcester Deeds, lib. 1, p. 173. Robert Houghton Jr married Deborah Wilder, daughter of John Wilder and Hannah Atherton, BT, LWL: questions marriage of D. Wilder and Robert Houghton; CJV: probate records verify marriage. "Nourse says of the information in his Appendix; i.e., pages 451-453 "The following lists of Marriages and Births in Lancaster families, not found in preceding pages, being mostly of dates when town, county and church registers fail us, are supplementary to those of Deaths and Marriages on pages 19 and 20. They have been made up from sundry sources supposed reliable." Guess the emphasis should be on supposed. Ebenezer Houghton married Mary Priest, daughter of John Priest and Anna Houghton, in Mar 23, 1720/21 at Lancaster, Worcester Co., MA, USA, by J. Houghton; MLM: Mar. 23, 1721/2. Problem Possibility that Elisabeth Garfield was Joshua Sr's wife, not Joshua Jr. Only JWH and MLM give her as wife of Joshua Jr.
Nancy Wilson: My husband is descended from Joshua Jr's sister Vashti Houghton. In doing her line I noticed that her father, Joshua Sr, was widowed relatively early in his life but, unlike most men of the time, there was no mention of a second marriage. His surviving children were certainly not infants but, nonetheless, he was left with children under the age of 10 and one would expect him to marry if only to provide care for these children. One reason for men not marrying, I have found, is that they 'take off' on a spirited adventure, ie go West, strike out for the gold fields, whatever. However, Joshua Sr seems to have stayed very local as evidenced by the filing of his will in Worcester. So, we are left with the inference that he remained a widower for 35- 40 years and died the widower of Elizabeth Bennett. 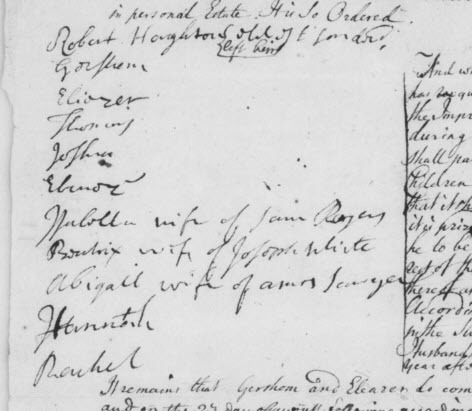 Meanwhile we appear to have his son marrying, Elisabeth Garfield/Gaffel, in 1746 (about 5 yrs into his father's widowhood) having no children, and this wife dying soon enough/young enough to allow him to marry a 2nd time and have a family. Is it all possible? Absolutely. But barring proof positive, we must hold out the possibility that Joshua Sr re-married, to Elisabeth Garfield, after 5 yrs or so of being a widower. Joshua Houghton married Elizabeth Bennett in Apr 8, 1719 at Lancaster, Worcester Co., MA, USA. Joshua Houghton and Elisabeth Garfield declared their intentions of marriage on Oct, 1746 Lancaster, Worcester Co., MA, USA; Joshua Houghton of Lancaster and Elisibeth Gaffel of Shrewsborough; JWH and MLM give Joshua Jr as husband. 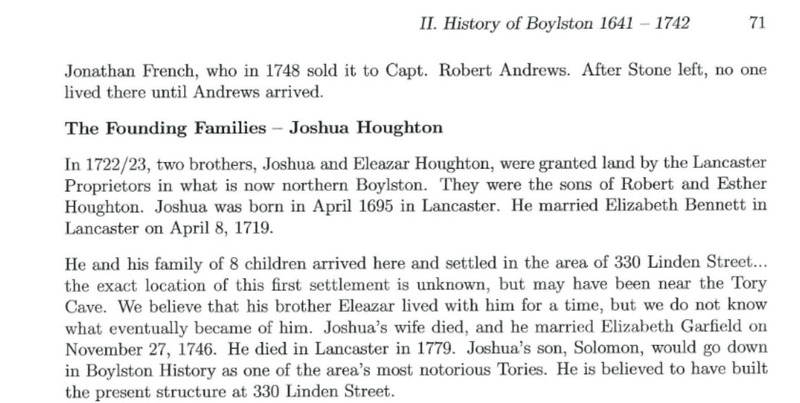 Joshua Houghton married Elisabeth Garfield in Nov 27, 1746 and was documented at Shrewsbury, Worcester Co., MA, USA, Joshua Houghton of Lancaster and Elisabeth Garfield; JWH and MLM give Joshua Jr as Husband.